This may be the last ever photo taken at the site of the Weir Stadium. 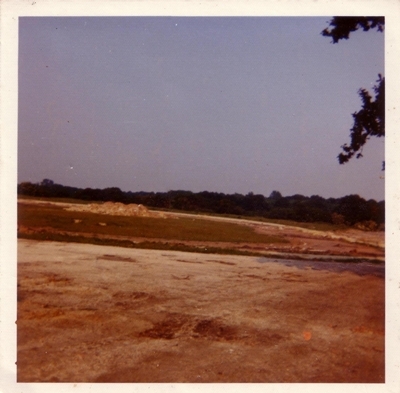 This was taken just where the main gate would have been looking at turn four and the main stand and starting gate. Turns 1 and 2 are also in the background. "As a teenager I worked in the pits when Arthur and Tippy Atkinson were in charge. To me Jack was my hero, but you shouldn't forget Poppa Pete Lansdale and Maurie McDermott." "Was very interested to see the article on speedway. My grandparents, parents and my brother and I were keen supporters of Raleigh up to 1953 when we all immigrated to NZ. My dad became friends with a lot of the riders as they used to come into the Eastern Cafe (on Eastern Avenue in Romford) which my grandmother owned. We became good friends with Les McGillivray and his family, and after the speedway used to go to his mum's house (Mr and Mrs Mac) . Lovely people. When Les had a bad accident my grandmother paid for a new bike for him. I can still remember running from the gates on a Saturday night to claim a seat in the front row. On our birthdays us kids got a ride around the track on our favourite riders bike. Great memories. Maurice Dunn and Julie Benson the New Zealanders visited us when we went to NZ. I think on one occasion Jack Unstead came to visit us as well. Maury Dunn was killed in an accident in a power boat not far from where we lived. My dad used to go to a lot of the meetings with Les in different areas of England. We travelled to Swindon, west Ham, New Cross, Birmingham, Wembley, St Austell, Long Eaton, Wolverhampton, Hackney, Harringay, and a few more. I have all the badges from those clubs. Would look forward to hearing from anyone who also was a speedway fan in those days. They were marvellous memories of my childhood. "